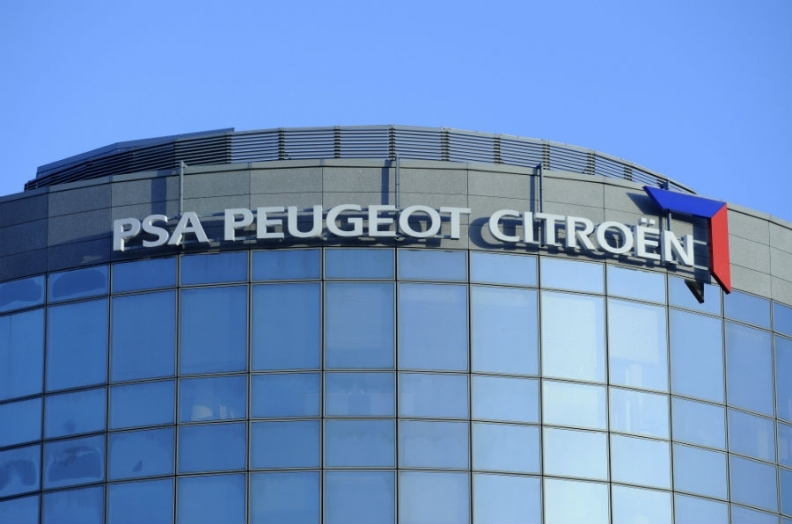 PARIS -- PSA/Peugeot-Citroen took a step toward its recovery goals, raising its key cash-flow objective after strong China sales and a recovering Europe helped the automaker post its first annual operating profit in three years. PSA's vehicle manufacturing division swung to a 63 million euro operating profit from a 1.04 billion loss in 2013. Group operating income was 905 million euros after a loss of 364 million euros a year earlier. The automaker's overall net loss narrowed to 555 million euros from 2.23 billion. "Our 2014 results show evidence that the process of rebuilding the group's financial fundamentals is underway," CEO Carlos Tavares said in a statement today. "We are ahead of our reconstruction plan," he said, announcing the automaker's 2014 financial results. PSA today pledged to deliver 4.2 billion euros in cumulative operating cash flow by 2017, more than double its earlier 2018 target. Operating free cash flow, excluding one-time gains and charges, was 2.18 billion euros last year, PSA said. The company was net debt free, it said. The group's net revenue increased by 1 percent to 53.6 billion euros in 2014 but automotive division revenue fell by 0.9 percent 36.1 billion euros as favorable changes in the product mix and in prices offset a very negative currency effect, PSA said. Analysts had expected group operating cash flow of just 500 million euros for 2014, according to a consensus published by Exane BNP Paribas. PSA shares have already risen 32 percent so far this year, buoyed by recovering demand in Europe, which still accounts for about 60 percent of the automaker's global sales. Dominic O'Brien, an analyst at Exane BNP Paribas, said the big surprise was the auto division's continued profitability in the seasonally weaker second half of 2014. "This is a very strong set of free cash-flow numbers," O'Brien said. "Pursuing profitability over sales volumes is starting to reap some rewards." PSA today reported progress on several benchmarks. Labor costs, which Tavares has pledged to reduce to 12 percent of revenue by 2016, fell to 13.4 percent from 14.5 percent. Savings per vehicle reached 730 euros, outstripping a 600 euro target set for 2016. Tavares aims to save another 600 euros per vehicle by 2018. The utilization rate in its European plants rose to 79 percent from 72 percent. Heavily reliant on Europe for sales and production, PSA survived the region's six-year market slump only after a 3 billion euro share issue that saw the French state and China's Dongfeng take 14 percent stakes in 2014. Tavares, who took over as CEO a year ago, is implementing a business plan called Back in the Race. The plan calls for the automaker to trim the model lineup by almost half, cut capacity, raise pricing and reduce wage and component costs to lift the automotive operating margin to 2 percent in 2018 and 5 percent by 2023. In addition, Tavares aims to better position PSA's three brands including the new luxury DS nameplate and continue his predecessor Philippe Varin’s efforts to restructure, in particular in Russia and Latin America. PSA’s total deliveries rose 4.3 percent to 2.94 million cars and light commercial vehicles last year. That’s still about 18 percent fewer than in 2010, when PSA, Europe’s second-biggest automaker, reported its last full-year growth with record sales of 3.6 million autos. Industrywide demand for cars will probably plunge by about 30 percent this year in Russia and about 10 percent in Latin America, PSA said today. In China, the carmaker said it expects demand to rise by about 7 percent. In Europe, it said it expects a 1 percent increase. PSA now sells more cars in China than in its home country and is betting on further expansion in the region. Together with Dongfeng, it aims to sell 1.5 million vehicles annually in China by 2020. The automaker's vehicle sales in the country surged 32 percent to 734,100 vehicles last year, with the market accounting for 22 percent of the new DS brand’s global deliveries. PSA forecasts 850,000 vehicle sales in China this year.